A hundred young people between the ages of 12 and 17, representing the diversity and inclusivity that we long to see in classical music, performed together in a festival orchestra at the Los Angeles Philharmonic’s Walt Disney Hall on Saturday, July 22. The orchestra comprised students from El Sistema–inspired programs around the country who were selected by audition, including one of Ravinia’s own—13-year-old Michael Robinson! The French horn player’s only access to music education has been through the Sistema Ravinia program at Catalyst Circle Rock School on Chicago’s West Side. What many residents don’t know about, however, is Ravinia’s efforts throughout the year to bring music and music education to underprivileged students in Lake and Cook counties, as well as to provide music instruction to Highland Park students. So I am always happy to tackle the question posed to me this week at Back Yard Grill: Why does Ravinia even have a gala? Ravinia Festival has welcomed conductor/teacherJavier Payano to the staff of its acclaimed REACH*TEACH*PLAY education programs. Payano will help establish an “El Sistema” inspired student orchestra at the Catalyst Circle Rock Charter School in the Austin neighborhood of Chicago. Even though it’s summer vacation for them, over 30 students have already signed up to play in the new student ensemble, which will be called the Circle Rockets. Payano was instrumental in establishing an “El Sistema” program at Hibbard Elementary School, which Ravinia supports. Ravinia anticipates building student orchestras in other schools under the banner Sistema Ravinia. The Ravinia Associates grossed nearly $378,000 at its annual fundraiser “Music Matters” on Saturday, May 12. This black-tie event benefits the not-for-profit Ravinia Festival and its REACH*TEACH*PLAY education programs, which provide students throughout the Chicago region with free music education. This year the event also honored the 50th anniversary of the Ravinia Women’s Board. The benefit was held at the Radisson Blu Aqua Hotel, 221 North Columbus Drive in Chicago, and was co-chaired by Dave Gaspar and Michael Brooks. The Ravinia Associates' President is Kara Longo Korte. The event attracted a record 500 guests. More than 200 students at all three North Shore District 112 middle schools had the unique opportunity of participating in a choral celebration with renowned choral artist, Shanka Falls, through a partnership between the 112 Education Foundation and Ravinia Festival’s Reach*Teach*Play Education Programs. On Friday, May 4, this musical experience culminated with a performance at Ravinia’s beautiful Bennett Gordon Hall. Ms. Falls, a Ravinia Teaching Artist, spent time with each grade level at Edgewood, Elm Place and Northwood schools to introduce the students to the rich tradition of gospel music, which spans from spirituals sung by African American slaves to today’s uplifting and joyful popular songs. A classical vocalist and teacher, Ms. Falls is the director of the choral program at the Ravinia Lawndale Family Music School. This season, for every new “like” on Facebook and “follow” on Twitter that Ravinia Festival receives, the Ravinia Associates board will contribute $1 to the festival’s REACH*TEACH*PLAY education programs (up to $10,000). Make sure you’re following Ravinia Festival on both Facebook and Twitter and help us spread the word by telling your friends, family, and social-media followers. With your help, we can give the gift of music to even more children and young adults all over Chicagoland. Ravinia’s education programs now serve over 75,000, and plans are in place to start an additional student orchestra this year. The promotion runs from April 26 until September 9, and we have already raised a grand total of $897 in 5 days, and it's still growing! With your help we can reach our goal of $10,000 to donate to our REACH*TEACH*PLAY education programs! For two consecutive days, the Ravinia Festival, through its Guest Artists in the classroom Program (GAIC) and in collaboration with Chicago Arts Orchestra (CAO), brought educational performances of rich and diverse repertoire of classical music to students from Telpochacalli Elementary and Hammond Elementary. Students had the opportunity to enjoy contrasting and yet equally fascinating repertoire by the likes of W.A. Mozart (Exultate Jubilate), Mexico’s Ignacio Jerusalem (Sinfonia in G), Luigi Boccherini (La Musica Notturna di Madrid), and Léo Delibes (Flower Duet from Lakmé) which rendered a unique experience. My family and I attended Ravinia this past Sunday for the Family Place events and the CSO concert. We are new to the Chicago area this year and that was our first true experience & picnic and all. My daughter is 4 1/2 and has always loved music at whatever age/stage she has been in. This weekend provided an experience for her (and us) that will stay with us forever. The volunteers at the Instrument Petting Zoo were wonderful. They were patient, enthusiastic, knowledgeable and an inspiration to the children. 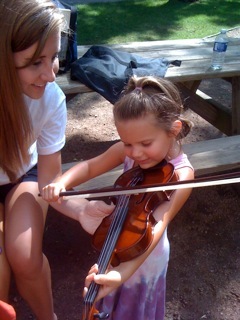 I am attaching photos of Isabelle's (my daughter) violin interaction. You can see the progression in both the volunteer and Isabelle's face as she listened, learned and then produced sound from the violin. She was so excited to hear the music! This happened at each station as my daughter was successful in making sounds on the violin, bass, french horn, trombone, trumpet, saxophone and clarinet. I want to thank you and your staff for generously providing this type of opportunity for the children. Not only did Isabelle get to experience music in a way that is truly unique, her mommy (Me!) got to feel the joy as she watched Isabelle's excitement. Isabelle also loved hearing and seeing the CSO. We hung out behind the Pavilion for a little while and she danced around like only a child can do as she felt the beautiful music of the orchestra.